How does Nokia's new king compare with the iPhone and G1? Updated: we have now posted our full Nokia N97 review. And you thought the Tube was the biggest thing to yet come out of Finland. Nokia has announced its new flagship mobile, the N97. Stung by the rise of the iPhone and the hype around the Android-powered T-Mobile G1, Nokia is pulling out all the stops to stay in the game. Here's your essential, one-stop guide to the new handset. 1. The N97 has a 5 megapixel camera phone with a Carl Zeiss Tessar lens. Compared to the iPhone's paltry 2 megapixel, that's a whole lot more impressive, though not peerless. And there's a dual LED flash, too – you really will be able to take proper pictures with this thing. 3. According to early reports, the pull-out QWERTY keyboard is good to use and is quick, and there's also the magic of cut and paste which, of course, the iPhone doesn't have. 4. Like other Nokia GPS-enabled mobiles, there's the ability to do turn-by-turn directions but with a twist - the N97 has a built-in compass like the T-Mobile G1 but unlike the iPhone. 5. Like Apple's OS X-powered version, the Nokia's home screen is fully customisable and you can move widget icons around with your finger. You can also flick though your photos, like on the iPhone. Even old people can do that. 6. There's a whopping 32GB of internal storage for music, photos, video and more. There's also space for another 16GB via the Micro SD slot. 48GB on a mobile (expect 64GB to come next from Apple, then). 7. Nokia has quoted a price of $550 before network subsidies – expect it to cost a fair amount even with a contract in the UK, at least at first. 8. Nokia is also making the most from the N97's battery life. It promises the new handset will "kick out up to 37 hours of music and 4.5 hours of video." The batteries are also fully interchangeable. 9. The new phone has been ergonomically designed and it's definitely smoother than many previous Nokia mobiles – a clear iPhone influence. 10. 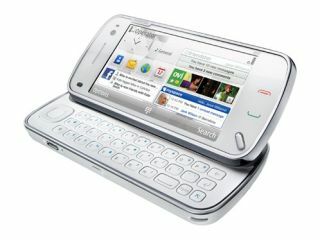 The N97 runs the 5th Edition of Symbian's S60 operating system – now fully touch compatible. Symbian is now fully-controlled by Nokia, so expect even tighter integration between the OS and hardware in future. 11. Connectivity goes the whole hog, with HSDPA, Wi-Fi, USB 2.0, stereo Bluetooth and a 3.5mm headphone jack (and the GPS, of course). 12. The N97 will be out towards the middle of next year. Nokia says the phone is an "evolutionary milestone for Nseries and mobilekind," also adding that the N97 isn't a device that will trigger knee-jerk hysteria." Ouch, Mr Jobs. Ouch.